Sunday the world lost the comedic genius of Gene Wilder. I remember as a child loving his kooky character in the original Charlie and the Chocolate Factory (sorry Johnny Depp, you’re just creepy) and the hysterical Young Frankenstein. 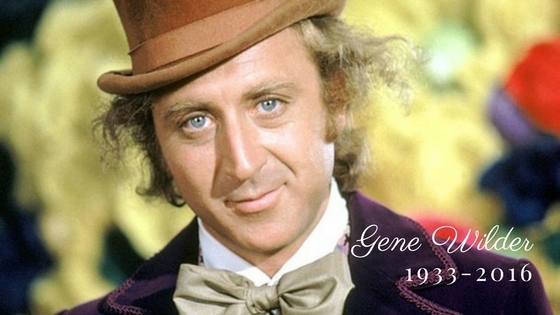 What I didn’t know was that Gene Wilder had been diagnosed with Alzheimer’s three years ago. His family shared: It is with indescribable sadness and blues, but with spiritual gratitude for the life lived that I announce the passing of husband, parent and universal artist Gene Wilder, at his home in Stamford, Connecticut. It is almost unbearable for us to contemplate our life without him. The cause was complications from Alzheimer’s disease with which he co-existed for the last three years. The choice to keep this private was his choice, in talking with us and making a decision as a family. We understand for all the emotional and physical challenges this situation presented we have been among the lucky ones — this illness-pirate, unlike in so many cases, never stole his ability to recognize those that were closest to him, nor took command of his central-gentle-life affirming core personality. It took enough, but not that. The untimely death of Gene Wilder saddens us all. It saddens me to think of the awareness that he could have brought to the disease that affects five million Americans. It saddens me that the children he was trying to protect from the reality of this vicious disease have family members that could have used increased exposure and attention from Mr. Wilder’s fame and diagnosis to garner the support of the medical community and the world at large. It saddens me that his family had no public support. Regardless of whether Gene Wilder was right or wrong in keeping his diagnosis private, as a caregiver I recognize there are thousands of individuals and their families with this same disease that are going at this alone. I don’t want anyone to ever feel alone in this disease process. You will be greatly missed Gene Wilder.